This image called “Clotted” won the 1st prize in this year’s Images of Research Photography Competition run by the University of South Australia (UniSA). It reveals the microscopic landscape of a blood clot caused by a medical device designed to treat aspects of cardiovascular disease. The current generation of stents and other implantable vascular devices are prone to adverse events occurring once in contact with blood, due to the incompatibility of the materials used. Dr Eli Moore is a Research Fellow at the Centre for Cancer Biology – an alliance between UniSA and SA Pathology. Eli acquired the image using a ZEISS Merlin ultra-high resolution field-emission gun scanning electron microscope followed by hand tinting in Adobe Photoshop. 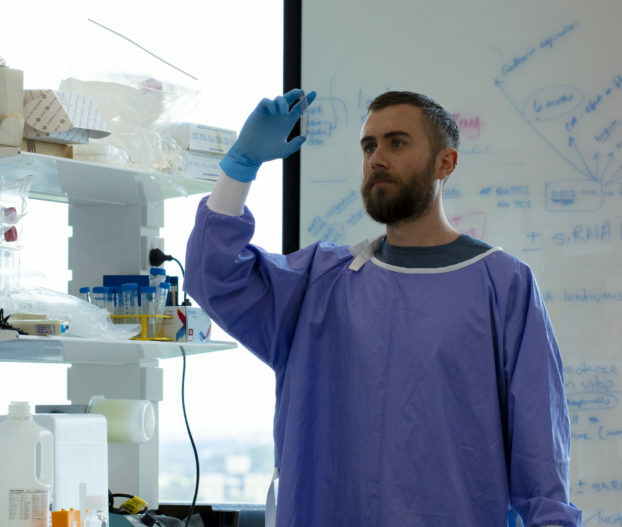 Dr Eli Moore is a Research Fellow at the Vascular Biology and Cell Trafficking Laboratory of the Centre for Cancer Biology. What are the big issues in your research area? The biggest issue in the field of stents (and implantable medical devices in general) is the compatibility of the interface between the inorganic material of the device and the surrounding biological environment. Without adequate pharmacological intervention, current generation devices can rapidly trigger clotting within the stent. While strict regimes of blood thinning medications reduce the instances of these events, scarring within the stent can also occur due to the binding of unwanted cells to the device. Ideally, future generations of these devices will incorporate properties at the surface of the device that inherently prevent clotting while also promote rapid healing into the surrounding tissue. This will reduce dependence on medications while also improving the quality of life for the patients. My research has led to the development of a process for applying a thin film (less than 20 nm) of hyperbranched polyglycerol (HPG) to almost any substrate including metals, polymers and ceramics. The HPG coating, when applied by this process, is highly effective at preventing cells and proteins from binding to the surface while also inhibiting inflammatory immune responses. In vitro I have also demonstrated that this HPG film is able to prevent the rapid formation of blood clots within commercially available stents. By studying the coated devices under ZEISS epifluorescence, confocal and scanning electron microscopes, it is evident that, at least in part, clotting is prevented by the HPG’s ability to completely prevent platelets (and other cells) from adhering to the surface. Preventing the nonspecific binding of cells and proteins has provided the ideal platform for exploring highly specific cell capture. I have demonstrated that specific types of cells can be captured and grown on the surface when certain biomolecules are first covalently coupled to the HPG coating. With this technology I am aiming to develop implantable medical devices that do not trigger blood clots while also promote rapid healing of the device into the surrounding tissue. If you had unlimited resources, what would you do with them? Ultimately, I would like to continue development of this technology right through to commercialization. I would also like to broaden my research into other implanted medical devices and many other applications where I think this technology could provide a benefit. Besides my core research, I am always looking for opportunities to capture amazing imagery. I would like to build a portfolio of imagery that links the abstract world of electron microscopy with highly detailed macro images of the same specimens. This image called “Clotted” won the 1st prize in this year’s Images of Research Photography Competition run by the University of South Australia (UniSA). 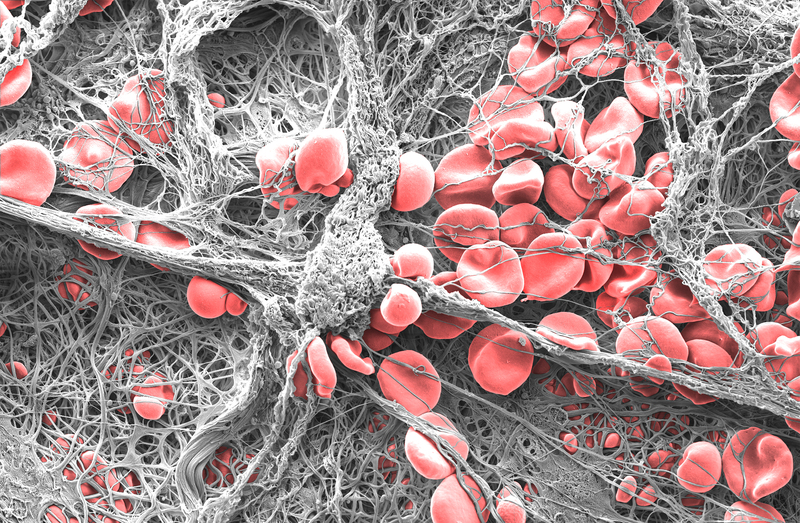 It reveals the microscopic landscape of a blood clot caused by a medical device designed to treat aspects of cardiovascular disease. In this article Dr Eli Moore who acquired the image answers three questions about his research.